Spice Tea Low Carb Cookies - super easy low carb sweet treat! Spice Tea Low Carb Cookies – super easy low carb sweet treat! 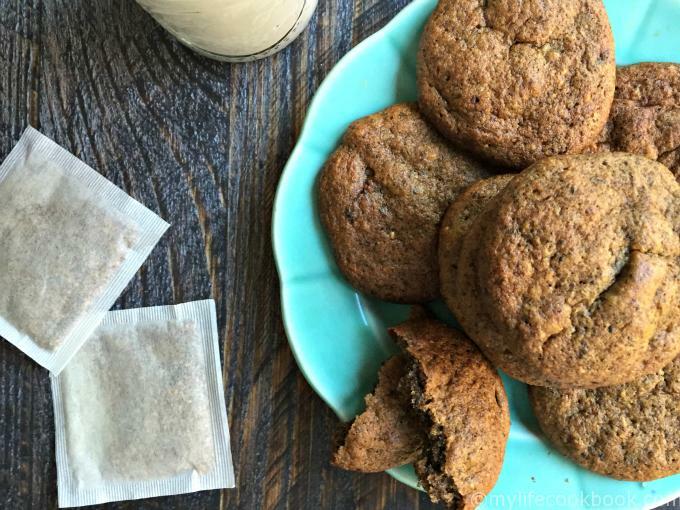 These spice tea low carb cookies are now my go to cookie on a low carb diet. Only a few ingredients, a few minutes to make and 0.8g net carbs. 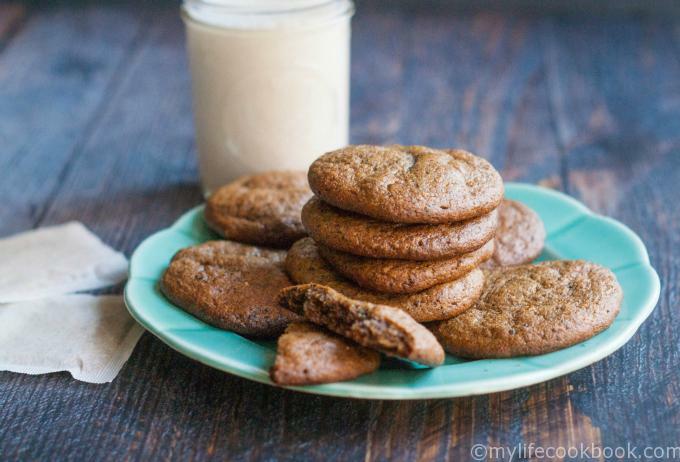 You might also love these low carb chocolate brownie cookies! I love cookies. As a matter of fact I was daydreaming the other day about having a cookie tasting party just as an excuse to eat cookies. But I know if I did I would get sick from them and I am trying to keep it low carb. 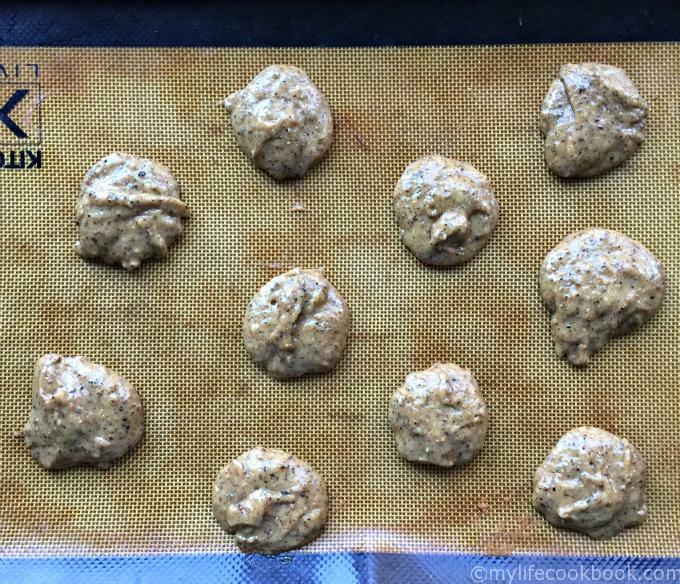 So I came up with these little spice tea low carb cookies instead. There are only 5 ingredients in these spice tea cookies: walnuts, tea, sweetener, egg and baking soda. They only have 0.8g of carbs per cookie and they are so easy. Best of all they are tasty and help curb my sweet tooth. And as for the sweetener, I used Swerve. I tried it with Splenda but it came out drier. They were ok but I preferred it with the Swerve. If you use another type of sweetener you will have to play around to get the texture you want. The first thing you want to do is put your raw walnuts in a food processor. 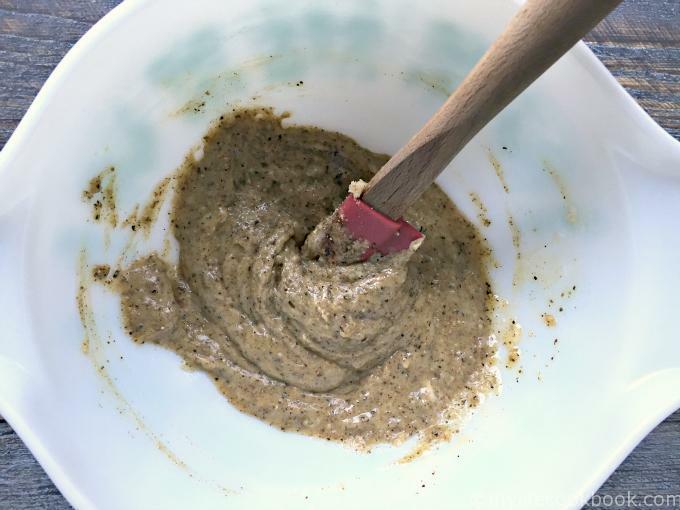 Blend on high until it starts to turn into a nut butter. You don’t want it too smooth but you want to break down the nuts and let the natural oils come out (see pic below for consistency). Then you add your tea, egg, sweetener and baking soda and blend until well combined. I used Celestial Seasonings Gingerbread Spice tea because I wanted something spicy but wasn’t sure what combination to use and I knew I liked this tea. It turns out it was great! It’s herbal so there is no real tea in these bags but lots of tasty spices (cinnamon, ginger, carob). Batter texture for these ow carb cookies. What is the texture of the batter? Above is the batter for the cookies. It’s sticky but it will spread on the pan. This batch made me 10 good sized cookies. You can make them smaller or larger if you want. It almost looks like nut butter doesn’t it. Make sure to use a silicone mat or parchment paper when baking. And here is what they look like below. They are more chewy than crunchy. I think if you left them in longer they would be crunchy but I’m not sure to be honest. Note they are not that sweet. If you are using regular sugar they will be sweeter but the whole point is that this is a low carb cookie. And if you don’t care about the low carb thing but want a healthy cookie in a hurry, you can use coconut sugar as a substitute. The final baked cookie – chewy and delicious! I have already made this recipe at least 3 times. I like using the walnuts because they have essentially little flavor and are like a blank canvas and they are low in carbs. Also they break down into a butter quickly. 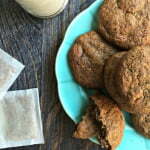 These low carb spice tea cookies are now my go to cookie on a low carb diet. Only a few ingredients, a few minutes to make and 0.8g net carbs. 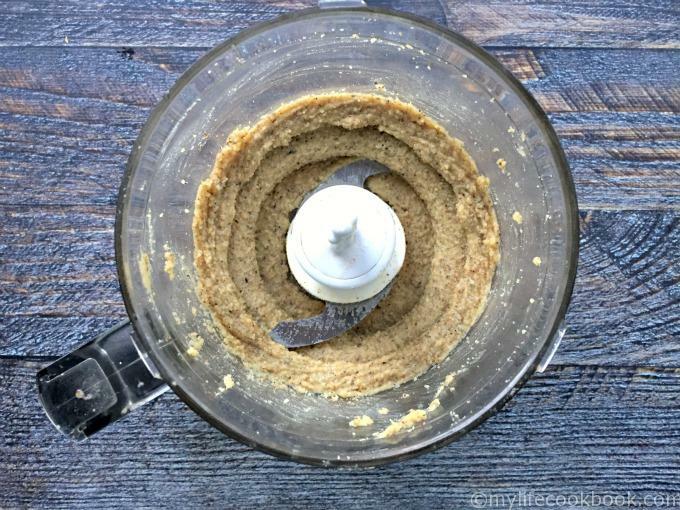 In a food processor add your nuts and process until it becomes a batter but not yet a smooth nut butter. Dump the tea out of the teabags and add the rest of your ingredients. Pulse until well mixed. Cover a cookie sheet with parchment paper or silicone mat. Spoon out batter, about a Tablespoon each. Cookies will spread during baking. Bake for 8 minutes. Check to make sure they are nice and brown but not too crunchy. Store in a sealed container. I freeze mine. How do you use the tea in the cookies? Do you prepare the tea first with water or what? You just take the tea out of the tea bags and use it. Just add it to the batter like you would a spice. Hope that helps! I’ll add that to the recipe. Wonderful recipe! 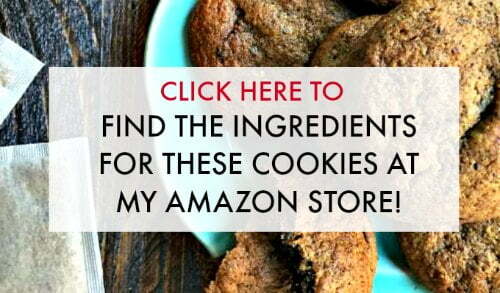 Look forward to making these for my low-carb personal chef clients! These sounds really good. I love gingersnaps and miss them during LC. This recipe makes about 10 decent sized cookies. You could of course make them smaller and get more. even at more spice if you want. I definitely have got to try these!! They look so delicious and different, I’m so tired of all the cookies I make. Thanks Julie I hope you like them! Low-carb, easy to make, and tasty? WOW these cookies are everything! I love spice cookies. I have an old coffee grinder dedicated to grinding various spices. I love the tea idea! No grinding required! I know! The tea worked out surprisingly well. What a creative recipe – I love the sound of all the flavors in here and relatively healthy too – bonus! Denise, the flavor in these tea cookies is makign me drool. This is a great recipe! Oh me too Joy! I love my cookies.